Embedding is one instance of some mathematical structure contained within another instance, such as a group that is a subgroup. Today in this post I have compiled a list of some of the amazing free embedding plugins for WordPress that are useful for your wordpress blogs. You are most welcome to suggest any additions to this list. You can use the comments box below to make any suggestions. If you like our art collection, so check out these other posts will interest you too: Free WordPress Themes with Flexible Header, Cool WordPress Video Sidebar Widgets, Premium WordPress Education Themes and Free WordPress iPhone Gallery Plugins. One shortcode to embedding instagram images with full customize. Features: One shortcode only and easy to use, Full customize and unlimited colors, Full caption, caption excerpt, disable caption, Fully responsive, Compatible with any lightbox and more. 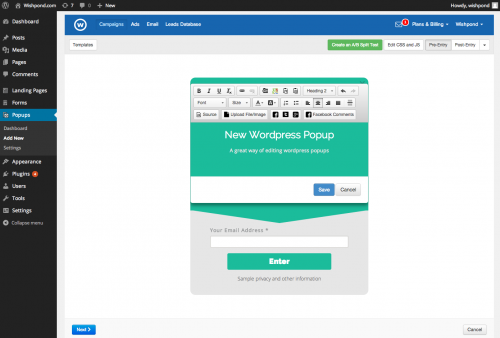 This plugin lets you create Popups and add them to standalone WordPress pages or embed them where you like. Get new leads, improve conversion rates, and manage all your popups in one place. A tool that makes it easy to build, publish and a/b test forms on your website, blog or facebook page, using flexible, mobile-responsive templates. Create Landing Pages, run A/B tests and more. Get new leads, improve conversion rates, and manage all your landing pages in one place. Run self-optimizing ads to generate new leads. Run marketing campaigns to generate and nurture leads. A Chrome-less Youtube video player that let you play any YouTube video as background of your WordPress page or post. You can activate it for your home page from the settings panel or on any post or page using the short code as described in the Reference section of the settings. The VidAnalytic Plugin is a video analytics suite that provides bloggers with live tracking, insightful data, and analysis of what videos are truly consumed on their sites. It allows you to track all your embedded videos on all your sites’ pages without making any changes to any templates or the need for special shortcodes. YouTube Advanced Embed is a plugin that enhances the YouTube videos you embed in your WordPress site. It’s a feature-rich and smart upgrade to the standard YouTube embed. With our free wizard, you can also customize your YouTube embeds with third-party annotations, chapters, and more. The Embed Image Links WordPress plugin can save you a lot of time, when creating posts or pages for your website. Just paste a link to any online image directly in your text, and this plugin will automatically replace it with the image that it is pointing to. Vixy YouTube Embed and Download is a simple, powerful method of embedding YouTube videos, offering your readers an easy way to download videos. Automatically generate playlists based on user name or search text. Build your own playlists and play them back however you want. Adds a link under embedded video’s which allows the users to convert the video to mp3. It supports Youtube, Vimeo, DailyMotion and many others. Default WordPress behavior without any wordpress plugin. Easy embedding of videos for the Ooyala Video Platform. Browse and search your Ooyala’s videos, and easily insert them into your posts and page. Upload videos to your Ooyala account directly from within WordPress.